Ce rez de chaussée, oasis tropicale est à quelques pas de l'océan et se trouve entre deux belles plages avec une autre plage protégée en face. Les couchers de soleil et la vue à 180 degrés sur l’océan depuis votre véranda sont extraordinaires !. a même une machine à cappuccino et un moulin pour votre usage. Notre salle de bains mise à jour dispose d'une grande baignoire ainsi que d'une douche avec eau chaude et bonne pression. Nous venons juste un tout nouveau canapé-lit dans le salon qui est très très confortable et facile à travailler. Nous venons également d’ajouter un nouveau téléviseur à écran plat 55 "pour votre plus grand plaisir! Nous avons aussi beaucoup de livres pour votre plaisir de lecture. Miles de chaud, calme, océan peu profonde juste en face de vous faire un endroit idéal pour ceux qui ne nagent pas bien, que le bien-être idéal pour la plongée, paddle board et le kayak. Vous pouvez voir des tortues, des dauphins, des baleines et d'autres animaux marins intéressant. Vous êtes également à proximité de grands spots de surf. 1. Grande véranda en bord de mer avec manger et coin salon avec vue sur l'océan. Face à la véranda et avant la plage est, une pelouse lisse vert avec des chaises longues pour ceux qui veulent bronzer sans le sable. 2. Cuisine bien équipée avec grand réfrigérateur et machine à glace, machine à cappuccino, moulin à café et cafetière. 3 Grande baignoire dans la salle de bain avec beaucoup d'eau chaude. 4 Chambre confortable avec lit king size et de la télévision pour les films et DVD / lecteur de CD. 5. Une laveuse / sécheuse pleine grandeur neuve. 6 Grande télévision, lecteur DVD / CD et WIFI dans le salon. 7. Le prix du site gagnante restaurant en face de l'océan. 8. Sur place, face à l'océan piscine avec chaises longues. 9. Terrasse sur le toit au sixième étage avec barbecues et tables de pique-nique. Vous pouvez voir toute l'île. 10. Barbecues et jeu de palets océan. 11. Près de tous célèbres plages de South Shore de Maui ... certains des meilleurs sur l'île. 12. La distance des commerces et des transports en commun de la marche. 13. La nuit, des persiennes métalliques de sécurité / de sécurité transparentes. This property made our honeymoon that much more incredible. The owner was very communicative and I can't say enough about how wonderful the place was. We took a 10 day honeymoon and so while we had many activities to do, it was so nice being able to relax in such a beautiful property. It was clean and had everything we needed. Highly Recommend!! Thanks so much for your good review. I am so glad my condo was part of what made your honeymoon so special! The views right out to the beach are amazing and really made the stay worthwhile. Other than that the condo wasn’t great. The lights flicker in the room and barely work. There were ants in the kitchen, the floors were very dirty and you hear every sound around you. The furniture is outdated and not very comfortable. Not sure we would stay here again, but they views were definitely amazing and beautiful. I am sorry you found our condo to be lacking as we really go out of our way to have it be as great as possible. I have never heard of the lights flickering, but perhaps it was due to the major storms we were having on the island which affected Maui electric. (A major part of the island was without electric.) As for the ants, during wet periods the tiny ants come in so we put out traps. I wish you had called us and we would have come right over. As for the furniture, the couch is only two years old, the washer/dryer is brand new, the dining room table and chairs as well as the other furniture are top quality from Mind’s Eye Furniture, a high end company on the island. The 55” flat screen TV was purchased this year. Most everyone remarks how comfortable our king size bed is and how well they sleep. The fold-out bar in the living room is an old antique and is hand carved teak. The exception is the patio table and chairs. They were purchased 5 years ago and get quite faded from the sun on the lanai. They are scheduled to be replaced soon and new towels to be purchased in the next couple of days. Again, I am sorry that you only enjoyed the views and location. First, I would stay here again, just to experience the sheer beauty of sitting on the porch and looking out over a manicured lawn straight out at the ocean. That is what makes this place special. But it's hard to understand why they owner has filled the place with such 2nd rate amenities (sheets, towels, plates, fixtures, appliances, utensils, etc.) - all of which look like they came from a garage sale. With a small investment of decent things that are commensurate with the top notch property that it is, this place would be stunning. Fabulous spot, the beaches and the view! What an amazing spot! We had a wonderful time exploring the many beaches and the sunset every night! Loved everything and hope to make it back soon! Quiet spot with all the required amenities, could not have been any better. Uma was also quick to assist with any questions, thank you! 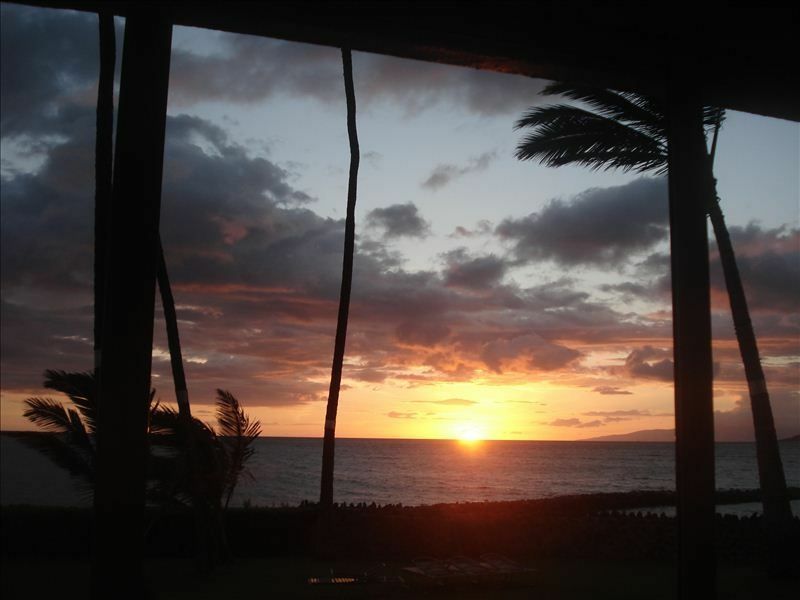 This property is ideally situated for taking in all aspects of Maui. This specific unit (ground floor, steps away from outdoor grill, pool and ocean) is ideally situated for Menehune Shores. Have stayed at this property numerous times, first time for this unit. Well maintained, recent bathroom renovation. Clear information/instructions provided, check-in a breeze. Everything functioned as expected. Would not hesitate to return. We have enjoyed numerous holidays in Maui over the years. This particular condo location on our most recent visit was the best we have ever had in relation to beach access and the beautiful views of the sunsets. There is no need to load up the vehicle to go snorkeling or to just simply go for a leisurely stroll along the waters edge with this location. The ground floor walk out condo was a perfect match for us. The building is not situated in the heart of Kihei however is central for connections to all tourist attractions.